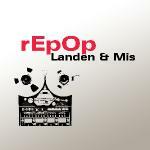 Dance N Dust :: Double D:CD05::.
.:: Landen & Mis-rEpOp DND EP 02 ::. Dance n Dust is proud to present rEpOp by Guy Landen and Eddie Mis. This here is a versatile duo with a strong background in the electronic music industry. Eddie Mis has been one of the first Israeli guys to compose and perform trance music (his famous track of the X-files with Chakra). Guy Landen (x Double Impact) with MA degree in multimedia Editing, Sound Design, and technical mastermind. Together they cooked up this delicious rEpOp LP. rEpOp can be described as deep electronic music fused together with themes like Industrial ,Techno, IDM , Breakbeat , Minimal and Experimental. The reason for all the hype behind this special release is simply it's beautifully, yet tactfully unique sound and intricate though powerful production, where every original sound and sample were carefully selected and obtained using high level recording (HD). Only highest standards here folks! !